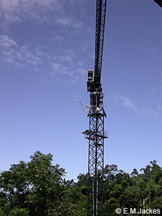 The Australian Canopy Crane or as it is now known as the “Daintree Rainforest Observatory (DRO) Research Facility” is located just south of Cape Tribulation approximately 2 hours drive north of Cairns in a World Heritage Area. IT is in one of the few areas where rainforest meets reef. The site experiences a strong wet season which occurs between December and April, although rain occurs in most months. The surrounding forest has over eight hundred species of vertebrates, many of which are endemic, as are many plant species. Students and researchers are regular users of this facility.